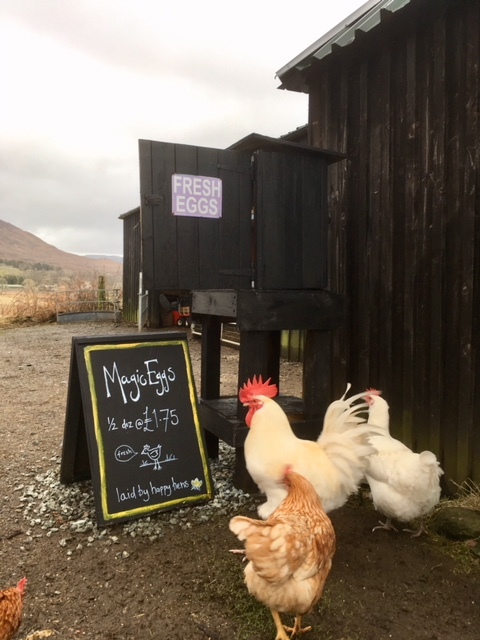 CraigardCroft: "Magic" eggs go on sale again....as the days lengthen, the temperature rises and visitors arrive. "Magic" eggs go on sale again....as the days lengthen, the temperature rises and visitors arrive. My poultry always look their best in January, they renewed their plumage before the turn of the year and short days together with low temperatures have minimised egg laying. The number of eggs laid peaks as the days lengthen and get warmer around April / May hopefully coinciding with the influx of visitors at Easter. Regular visitors make straight for the farm gate retail park, they can't get as good eggs at home or anywhere else. They've been "magic" eggs for years, since my daughter first painted the sign, "Magic eggs from happy French hens". It's a regular feature of holiday photos as are the hens as most people never see a live hen. These have always been dual purpose , laying eggs and calming traffic. Apart from the layers I have three Silkie x Light Sussex hens , their main job is to incubate the fertile french eggs and rear the chicks to about 6 or 7 weeks of age.I used to have a high-tec all singing, all dancing electrically heated incubator but the broody hen is much more reliable and so much easier. The red hens are modern, scientifically bred hybrids, they produce large numbers of big brown eggs, over 300 a year, until they die of exhaustion or go off to ,"Mrs Cheadle's Twilight Home for Chickens" at Sanna to end their days. If you select a population of hens for large numbers of eggs, generation after generation they lose the ability to go broody, hence the Silkies which have lots of feathers and have not been subject to selection for egg production.